The third section inside PFOREX Assist app is Options Signal in which wide range of powerful and best Options strategies, more than 20, are developed to deliver highly reliable and prime Options signals. Traders with any trading preferences and techniques can find the most favorite Options signals from multiple strategies. While some of strategies deliver reliable long term signals suitable for long term contracts such as Ladder, other specific strategies may bring short term signals for contracts like 60 seconds or Touch model. It is highly recommended that traders watch the signals video tutorials before using them. While some strategies are continuation, others may deliver reversal signals. From the menu side bar, Options Signals can be selected. Then the provided Options signals will be sorted based on the generated time. On the top bar, the different contracts are represented in which strategies are applied based on the signal types. From the Filter setting, you can find the contract types and applied strategies and patterns such as Special Candlestick pattern, Bollinger Bands, Hidden Divergence, Price Action and Ichimoku. Whenever an Options (Call/Put) signal is generated it has a bell sign. The bell sign shows that the Options signal is just generated and will have other status open, expired, TP and SL status. An Options signal will be in expired status if it does not meet the entry price until certain time after it is generated. When an Options signal is in Open status, it means that the signal just met the entry price. TP indicates that the price hit the target price in a contract after it is generated. A signal may be successful based on Call contract, however, it may be loss-making in Touch or other contracts. In case that the status is SL, price has hit the Price in No Touch contract or it did not touch the Target Price in Touch contract within certain amount of time. Trader can turn on notification alert by turning on the bell sign of a favorite Forex signal to receive any update in status of that signal. There are wide range of assets across major financial markets to meet all Options trading preferences. Traders can select limited number of desired symbols based on their PFOREX Member plan to receive the generated options signals. The assets can be selected inside the setting section with two options, Notify and Show. Notify will determine the received notification alert on that certain asset or strategy. Call/Put: The price may be over or below the current price at the expiry time. Higher/Lower: The price may be higher than a target price at the expiry time for Higher contract, while in Lower contract, the price must be lower than a target at the expiry time. Touch: The price must only hit the target price before the expiry time. No Touch: The price must not hit the target price within contract period. Ladder: In this contract there are different target prices. If the price passes each one of them before the expiry time, there would be certain payout. 60-Second: This is a short term contract that needs signals, with instant alert notifications, in which target price must be hit in 1 minute. Special Candlestick strategy delivers short term and medium term signals based on most reliable candle patterns. Bollinger Bands strategy includes candlestick patterns and divergence condition that is recognized by most reliable indicators or oscillators. Bollinger Bands Options strategies are categorized into four classes based on the price trend movement regarding Middle Line or Bands. Tweezer candlestick pattern generates a medium term or short term signal good for Options assets. The candlestick pattern in a divergence/convergence condition brings a reliable reversal strategy. The other strategy is consist of candlestick pattern in an area with hidden divergence condition that represents continuation signals. Price Action strategy delivers unique signals from best Options patterns after they are formed successfully so this strategy has tremendous success rate. This strategy indicates the traders’ tendency change on reversal spot after the take profit price of a powerful pattern is touched by market price. The R-Options strategy is classified into 3 types that are determined based on the reaction of price in regard to the major trend line with the help of major candlestick pattern. MACD Options is another strategy in which saturation, detected by an indicator or oscillator, is identified to be mixed with MACD indicator to develop a reliable signal. You can find profound courses in educational section to fully understand this strategy. The pivot strategy with the help of support/resistance levels generates reversal signals. The Ichimoku strategies help traders to find continuation signals in assets in which price trends increase or decrease considerably with certain slopes. The best signals can be delivered when the symbol price increases or decreases sharply rather than oscillating inside a narrow channel. Hence it is better to find the Call/Put or No Touch contract signals from this strategy. Now let’s check for the complementary information on Options (Call/Put) signals. The Options signals are delivered based on different contract types and various expiry time that traders must adopt the generated signals with the available contracts that their desired brokers offer. Unlike Forex signals, Options signals has expiry time, hence they need higher accuracy and more powerful conditions for higher success rate. Traders must consider about the contract expiry time by themselves with the help of fundamental and other technical analysis. Before finding the most reliable strategies, traders must have profound knowledge about the trading tools, indicators and patterns as well as Options trading principles and functions. Then traders should apply the favorite strategies on demo accounts to gain required information and skills for full mastery over desired strategies. The video tutorials of each strategy and educational courses will help traders considerably. 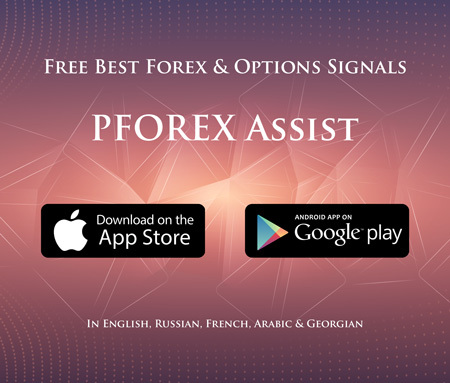 You can download PFOREX Assist app on App Store and Play Store to receive these signals instantly, however I have to insist that all the services provided PFOREX are as information, not as suggestion nor advice.